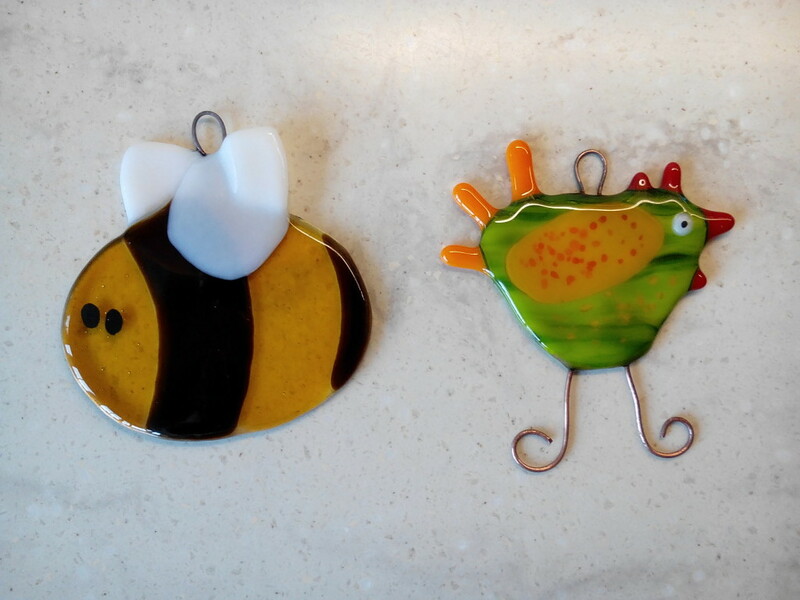 We have been making fused glass hens and bees, along with a few other bits and pieces. 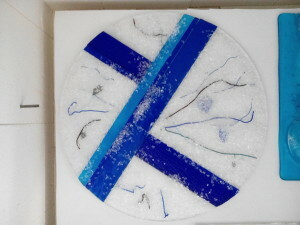 This is the final result post firing. For this run I reduced the temperature to 795 degrees C for 10 minutes as I felt that the 800 degrees C run was slightly over cooked and melted. And this is the kiln shelf full of hens, bees and beads. 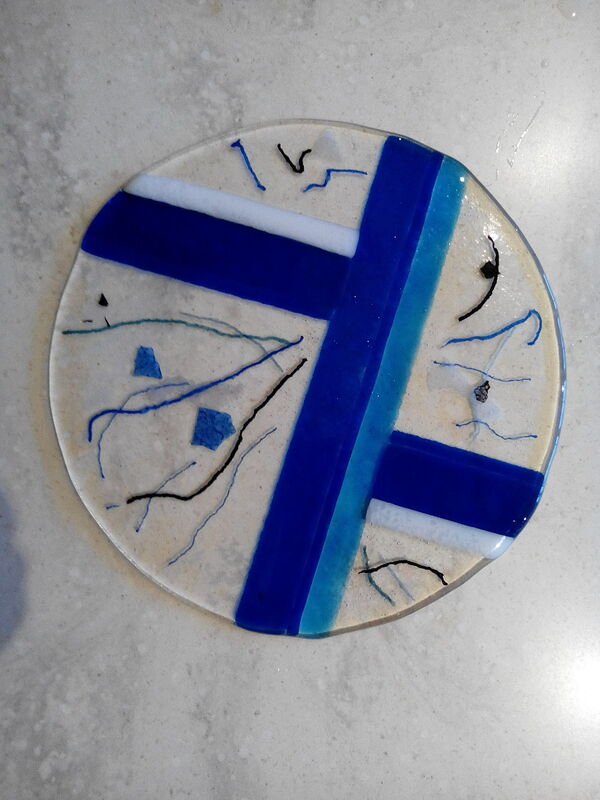 I am also refiring the plate I was trying to make into a dish, but for which I overdid the bubbles. I have since popped them and am putting them through the kiln again to flatten it down, before I make it into shallow bowl. We have been having a run on borage honey. 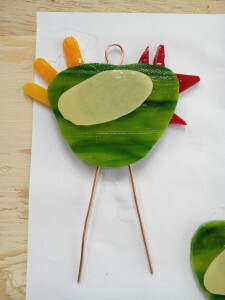 It has a delicate flavour and, as you can see from the picture below, it has a light appearance, almost transparent. Here you can see it alongside a jar of our summer flower honey. Borage is a herb, grown commercially for its oil. From the bees’ perspective it has good and bad traits, mostly good. It comes into flower in the break between other flowering crops and so offers a valuable source of mid-summer pollen and nectar, when the colony is at its strongest and in need of food. Its sugar balance also means that it does not set quickly, and so is easy to extract from the hive. This also makes it easy for the bees to eat, without needing to add lots of water themselves to liquify it. The only downside is that it only comes ‘on flow’, ie is nectar bearing, for a couple of weeks. If, as is often the case in the summer, we have a couple of damp weeks that coincide with flowering, then the bees don’t fly much and can miss the crop entirely. Adding in the fact that the crop itself is only grown to specific order, this all gives me, the beekeeper, a fairly rare, interesting and valuable honey. 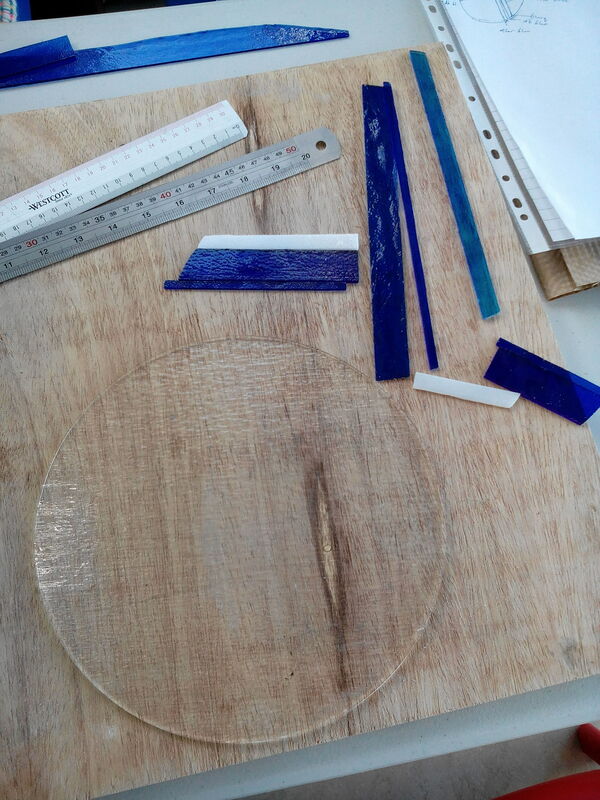 As you can see below, it began with a sheet of clear glass and some blue and white strips. The second picture shows the strips in place on the clear base. 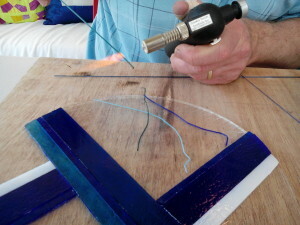 I am also making some curved glass rods using a small blowtorch. In the third picture they are in place. You can also see some ‘frits’, small glass chips, used to even out levels where glass has been added. This proved to be a mistake. 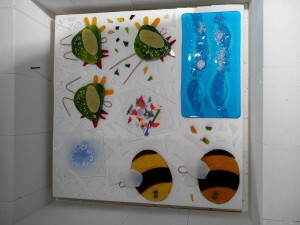 The next picture below shows the plate in the kiln. As always we are making use of every bit of space. 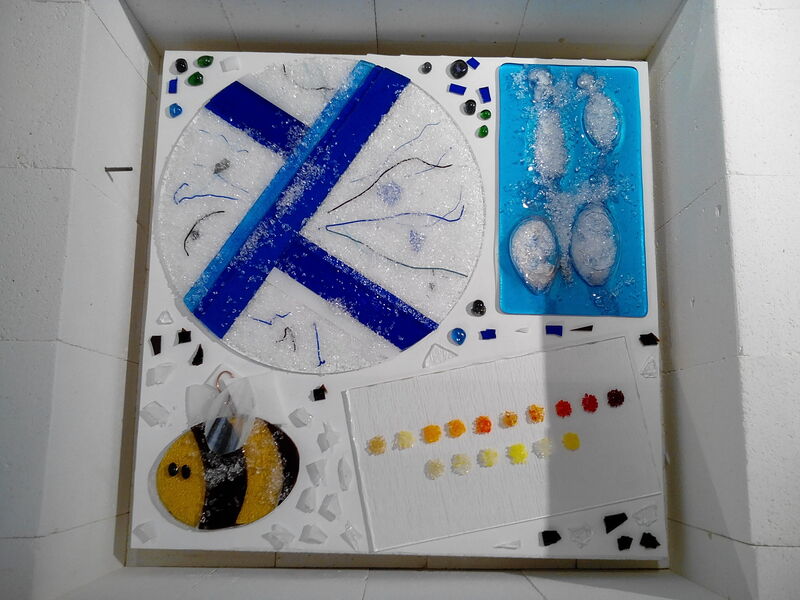 This time we are making some beads from rough cut pieces of glass, a bee, and are refiring the ‘bubble’ glass, which I previously put too much baking soda on, making huge bubbles which burst. The final picture below is the plate post-firing. At this stage it is flat. 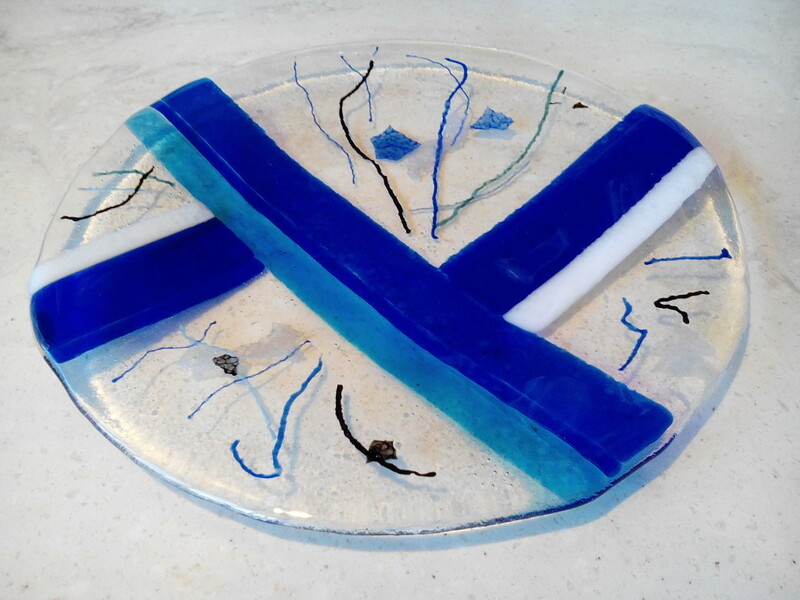 Next it is put back into the kiln, at a lower temperature, to ‘slump’ it into a mould shaped like a plate. The final result is the picture at the top of this post. 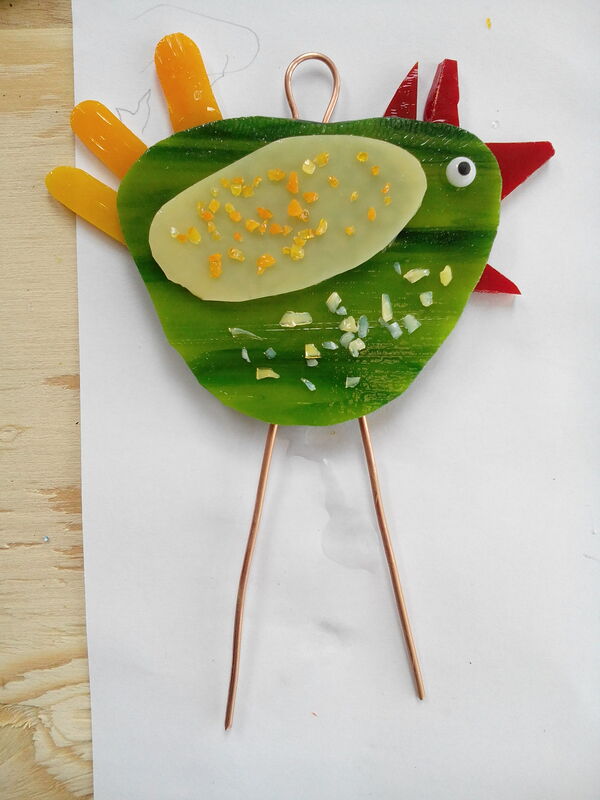 Don’t put clear frits over the top of coloured glass, at it leaves a ‘shadow’ that shows up in bright light. Put them only along the edges of added glass. 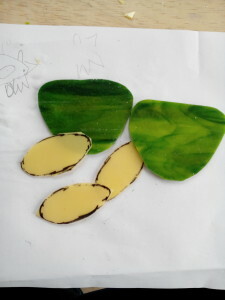 Unlike stained glass work, avoid grinding edges to make them fit better. 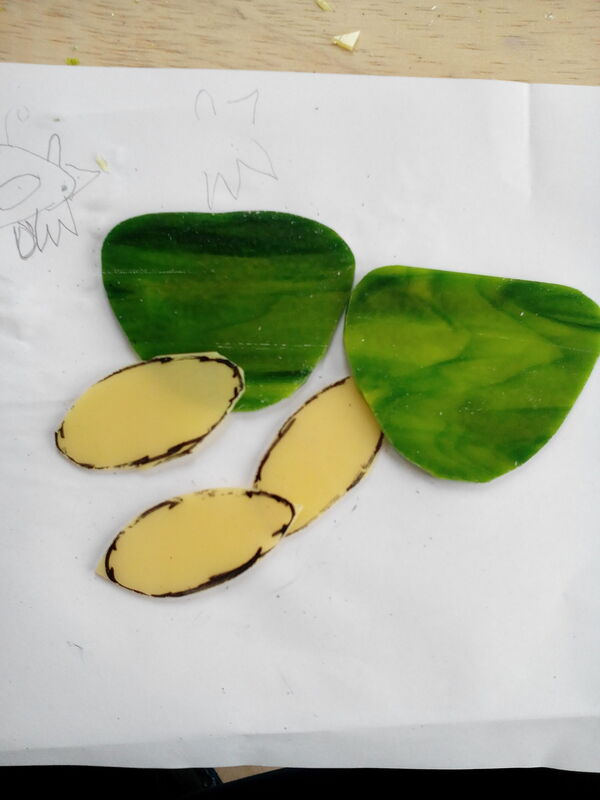 The result after firing is a dulled edge. It is much better to leave a less perfect, but clean, break. When adding glass over a clear sheet, and to the edge of the clear sheet, leave a gap. If you don’t then the bulk of the glass will produce a bulge along the edge. 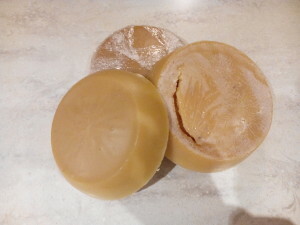 Beeswax is a very useful and valuable part of the beekeeping ‘harvest’. Bees produce wax by eating honey and releasing wax scales from slits along the sides of their abdomen. It is just one of many amazing feats they perform. Depending on whose numbers you believe, it takes between 6 and 12 times the weight of honey to produce the same weight of beeswax. For bees, wax has a simple role, they chew the flakes and form it into the honeycomb used to raise their young and store food in the forms of nectar/honey and pollen. For man, beeswax offered efficient sources of light. Beeswax candles smell so much nicer than those made from animal fats, and they burn brighter. Of course after candles came a number of other uses, from simple polish, to protective coatings for medicines, and as a component of ‘surgical bone wax’, used to control bleeding during surgery. For the average beekeeper, beeswax is obtained from two processes. 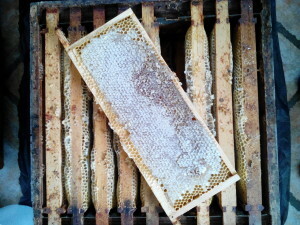 Firstly when an old frame is removed from the hive the wax can be recovered. The downside of this is that the frames are usually 3 or more years old and removed as part of a hygiene regime. By this time, there is a relatively small amount of pure wax left, as the frames are clogged with cocoons from the raising of young bees. After much effort you tend to get just a few ounces of wax per frame. Personally I use these frames for firelighters. The second, and in my opinion best, source of wax, is from ‘cappings’. This is the pure wax scraped or cut off the front of ‘super’ frames before putting them into centrifugal extractors to remove the honey. 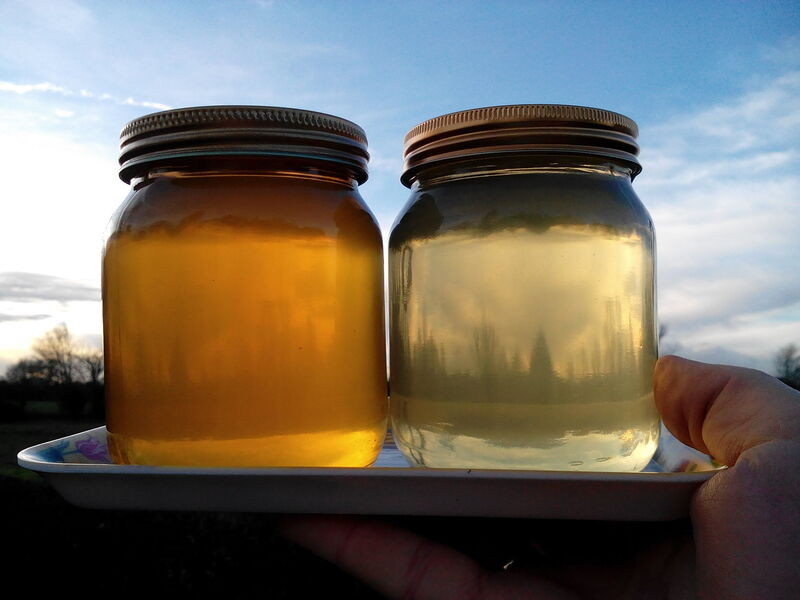 The resulting honey/wax mix can be given back to the bees to recover the honey, leaving pure clean wax behind. An average hive will produce perhaps 3 or 4 pounds of beeswax a year. Not surprising then that this wonderful product is so highly valued and sought after. 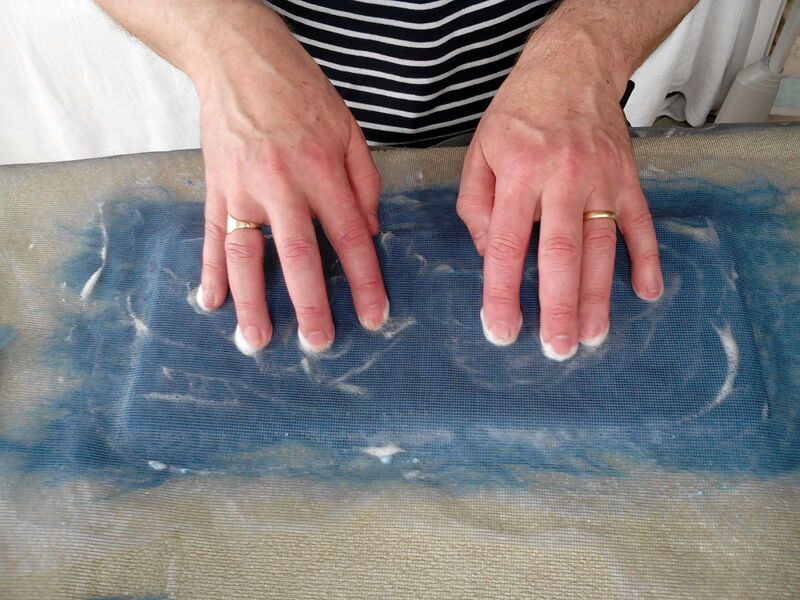 This week we have been felt making. 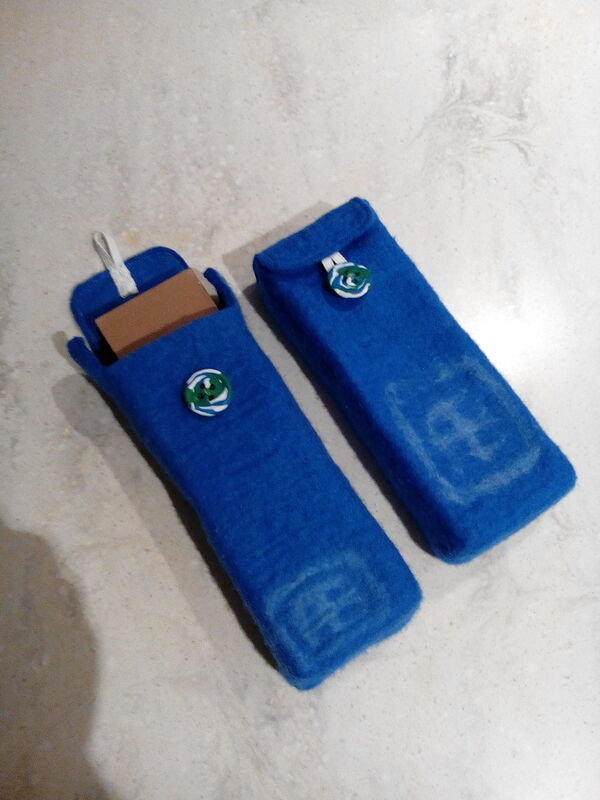 I needed protective covers for my Christmas presents, 2 water stones for sharpening my wood caving chisels, and felt covers were the obvious answer. 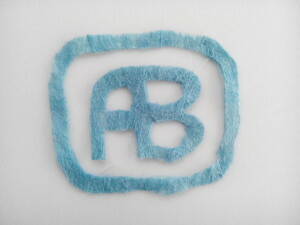 Felt making is an interesting and quite physical process, so you get a work out and a product at the end. The process begins with laying out the wool. Ours comes from Northumberland sheep, from the farm we visit every November. 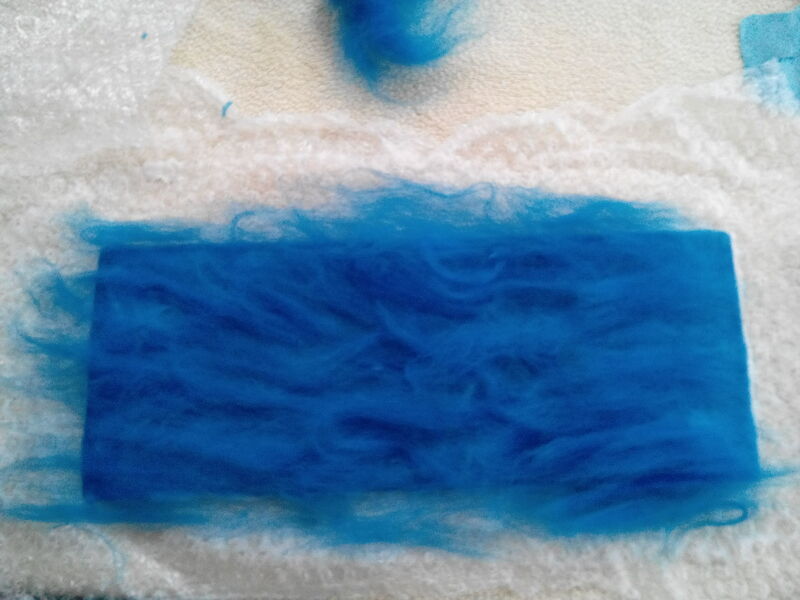 We swap honey and jams for fleece which we then clean, card and dye. Next you put a mesh over the wool and rub soap into the fleece. Repeat with fleece added at right angles to the last layer until you have built up about 6 layers. Here I am making a tube so the fleece is wrapped around a former, front and back. Add a cut out version of my logo in fleece. 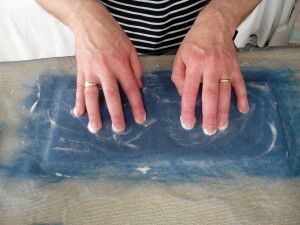 Rub, rub and rub, until you can feel the wool ‘felting’ together. 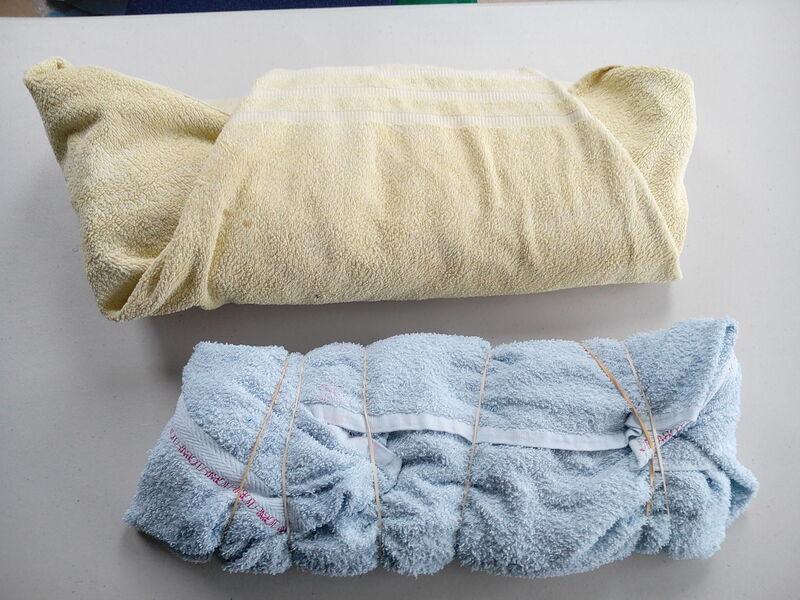 Wrap tightly in bubble wrap and a towel. Truss it together and put in the washing machine to complete the felting process. 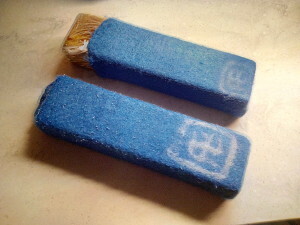 Last stage is to put a wooden former inside the felt case to the size of the sharpening stones. Wrap and then put back into the washing machine. Anyone who has ever washed a real wool jumper will know what happens now. It shrinks and goes very dense. The felting process is complete. Final stage is to add a home made button (made from fimo polymer clay by my wife), and then finish off with a flap. You can see the stone poking out of the left hand cover. It is also interesting to see the difference in how the logos have come out. One has stretched and the other has shrunk.